Here's an interesting group of buildings in Lewin Street, and a photo which will take some explaining. The original slide caption says 'council buildings', indicating that this was part of the MUDC depot (it will have connected with the council's yard which had an entrance on Town Wharf next to the BW warehouse). 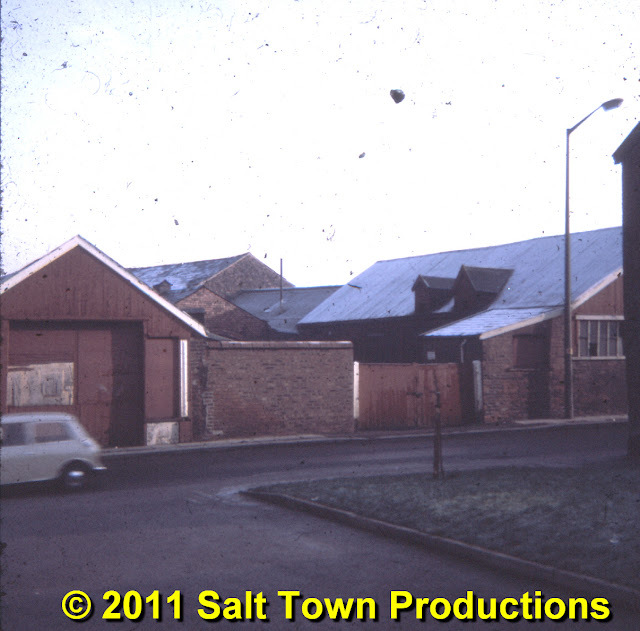 Originally this was Seddon's waggon repair workshop, associated with the Wych House Lane works behind it. Here all kinds of repair and maintenance work was carried out for Seddons where 'everything was done in-house'. On the right hand side was a long building, or series of buildings, opposite Middlewich DIY, which ran down the length of Wych House Lane and part of which is reputed to have been Middlewich's first Catholic Church. To the left, out of shot, are the Wesleyan Chapel, 'Square One' and the C o f E School. as seen in a previous slide. We're standing outside the then brand new Middlewich Library and the site is, of course, occupied now by the Salinae Centre and its associated gardens. Dave Roberts That's right now replaced by flats called 'Halfpenny Court'. Geraldine Williams There certainly was a Catholic church in Wych House Lane and a stone cross from the building is now mounted in the porch of the present St Mary's Church.